Hey Guys! So I finally got around to filming my San Diego haul this past weekend! I tried to make it as short as possible but i ended up rambling a little too much lol I also just figured out that i forgot to film the items i picked up at h&m but thats ok because this video has more than enough items to look at! I hope you enjoy! I also wanted to get in a quick Outfit of The day post today! 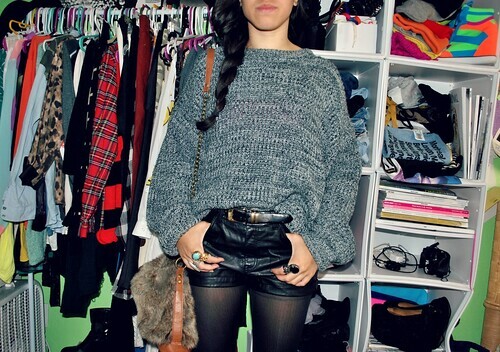 You guys do not understand how excited i am that i can finally get away with wearing leather and knits now! The knit that i am wearing is from topshop last winter and it is my absolute favorite knit that i own to date!I am also super excited that i found these awesome leather shorts that i'm wearing from h&m for only 24 bucks and they fit amazingly! If any of you guys are looking for a pair of good quality faux leather shorts that wont break the bank, i suggest you head over to h&m! Uugghhh I love your wardrobe! Everything you got is great, seriously Court. Ure so cute in the video I can't even deal !! ummm feel free to drop off that jumper in my closet at anytime! The store arden b. has black faux leather shorts on clearance with an additional 50% off so they would be around 12-14dollars check out your nearest arden b! so happy to see another video from you! i love hearing your mindset behind buying each separate piece. 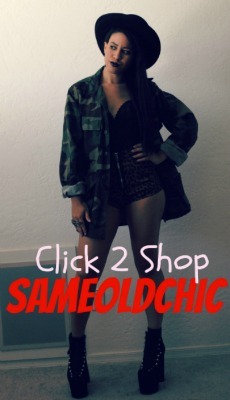 my favorites have to be that studded collar and the comic-graphic tank/dress from f21. i'm trying to picture what it'd look like as a tank and I totally agree that it looks better as a dress. I'll be scoping the f21's around where i live next week to find it! also, I have a quick question. for those triangle bras from brandy, do you wear anything under them since they're unpadded? not for support but rather to hide the nips? 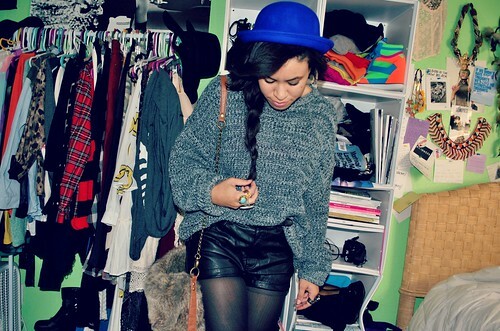 This jumper you're wearing is perfection ! I'm looking for a similar one like so jealous. Your jumper looks super cosy! I love H&M at the minute! Cute outfit. Especially love the hat. 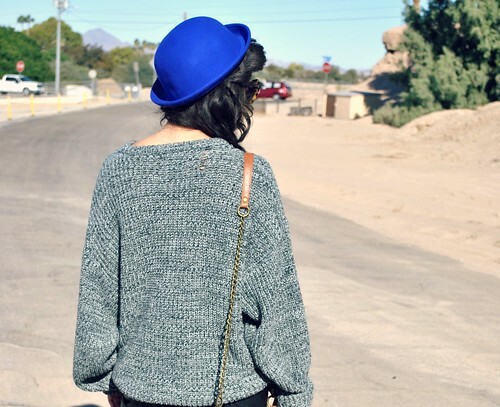 Cobalt blue is one of my favorite colors this season. Just saw your haul video. I ordered the same Brandy Melville bralette last week and it came in yesterday. It's so cute! I also got a velvet one...so in love with them! I'm also loving the zara shoes! The Wang knock-off ones are my favorite.I tried them on a few months ago in the sling back version in black...wish I bought them! And AREN'T ZARA JEANS THE GREATEST? I wrote a post not long ago saying they're the best fitting I've ever found. The go on sale for about $25 and you'll definitely be able to find your size at the end of the season. I find every size when I go early. I also have the zipper back shirt from last season! Haha. Oh my gosh. I could go on. Let me stop, hahaha.